Nordica's much-heralded Patron Freeski/Big Mountain ski returns unchanged for the 2013-2014 season—it's still a powder-devouring monster. Whether or not the Patron is a good or even great ski is not the question. What you should be asking is whether or not it's the right ski for you. I can't help thinking the Patron and I just didn't meet under the right circumstances. We got acquainted on a sunny day at Winter Park, Colorado, where fresh snow could be found only in patches hidden in the trees. That's hardly the kind of wide-open, steep-and-deep skiing the Patron was designed for. 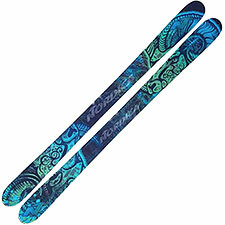 The ski, after all, is an abundant 113 millimeters underfoot, offering tremendous flotation in soft snow. Resort skiing, even on powder days, really doesn't showcase the Patron's true capabilities. That said, for its size the Patron is unexpectedly quick and lively, with a generous sweet spot. On hard snow the metal-free Patron offers a credible ride, though in both speed and edge grip, the ski breaks down well before Blizzard's Cochise. Like the Cochise, the Patron is category-defying, offering a ride that consistently outperforms expectations in a variety of conditions. Still, this is a ski that was born to float through deep powder, and it's hard to imagine riding it by choice on non-powder days when so many outstanding All Mountain skis are available. This issue of powder specialization is clearly one the ski industry is grappling with today. The simple truth is most resort riders will be far better served by narrower-waisted All Mountain planks. Of the Big Mountain skis I've tried, the Patron does perhaps the very best job of keeping one foot in each world. So if powder and off-trail steeps are what you live for, I certainly see the Patron as a ski of interest. Like all true classics, the ski is subjectively outstanding—more than just the sum of its parts. But it is a specialist, and these days, versatility is storming toward a comeback.